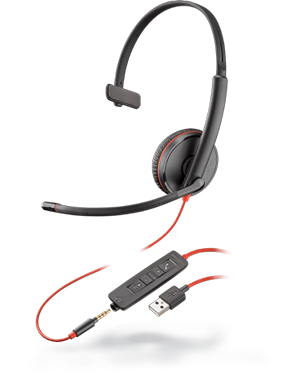 Plantronics Blackwire C3215 Monaural 3.5 mm/USB Headset is a device that features comfort, durability, and efficiency. This corded headset is Unified Communications supported with capabilities and functions that can boost standard communication performance. It boasts its superior audio quality through the integration of Hi-Fi stereo sound quality and the well-known noise-cancelling microphones integrated in the device’s microphones. The collaboration of these two features makes the device perfect for multimedia, music, and voice functions. In addition to these two, it also has the dynamic EQ feature to top it all. 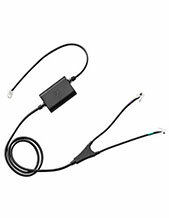 Plantronics Blackwire C3215 Monaural 3.5 mm/USB Headset is incredibly easy to deploy with a lot of connectivity options. This headset is structured to be ideal for knowledge workers and those jobs at an entry-level. Being extremely portably, this device is also very comfortable to use, with its lightweight metal headband, soft leatherette ear cushions, and custom fit design. Take out your phone and dial Australia wide 1300 131 133 for details about this top-notch product today! Plantronics was founded in the year 1961, in the period where the industry and society are filled with heavy and bulky headsets. The company was created in the first place in an effort to improve the industry and provide lightweight headsets. The company was able to accomplish this the very next year in 1962, with the introduction of the Plantronics MS-50. In fact, in 1969, Neil Armstrong used a Plantronics headset to communicate to the earth when he became the very first place to step foot on the moon. Plantronics has become the standard of innovation and development in the field of audio and sound electronics products and solutions. The company has its headquarters located in Santa Cruz, California. It is able to excellently provide the global market with excellent products and solutions more effectively with the help of many retailers, partners, distributors, and service providers in approximately 80 countries in the Asia Pacific Region, Europe, and North America. One of the best suppliers and wholesalers of consumer electronics products and solutions in Australia, Headsetsonline Pty Ltd offers the market with powerful product portfolio. 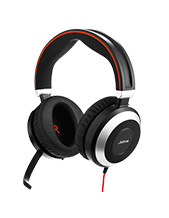 This portfolio is comprised of brand new and refurbished products and solutions, which are all displayed in the company’s online store at Headsetsonline.com.au. This online store is integrated in the company’s official site, which is enterprise-encrypted and secured. With the security measures used by the company, customers can be rest assured that all of the transactions that go through the store are protected. Headsetsonline holds the record of being a reliable enterprise in the market today. When it started, the company was simply a part of another popular enterprise that has been talking care of the audio needs of government agencies and corporate sectors since the year 1998. The company got its experience from working under this corporate and has improved its own operations and services since then.